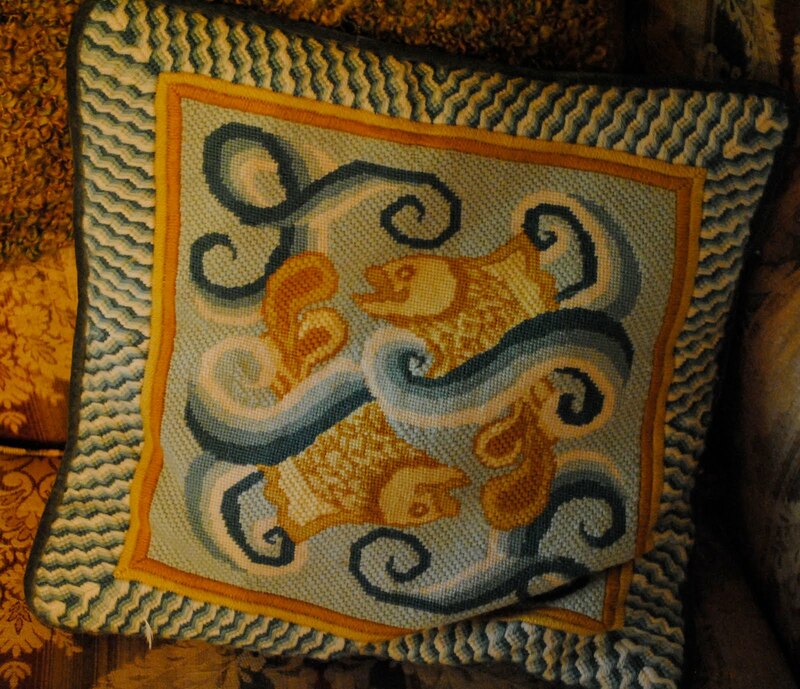 Pillows are an important part of Linderhof's decor. The sofa has two squishy square down pillows -- just perfect for laying your head upon when you want to stretch out for a nap! 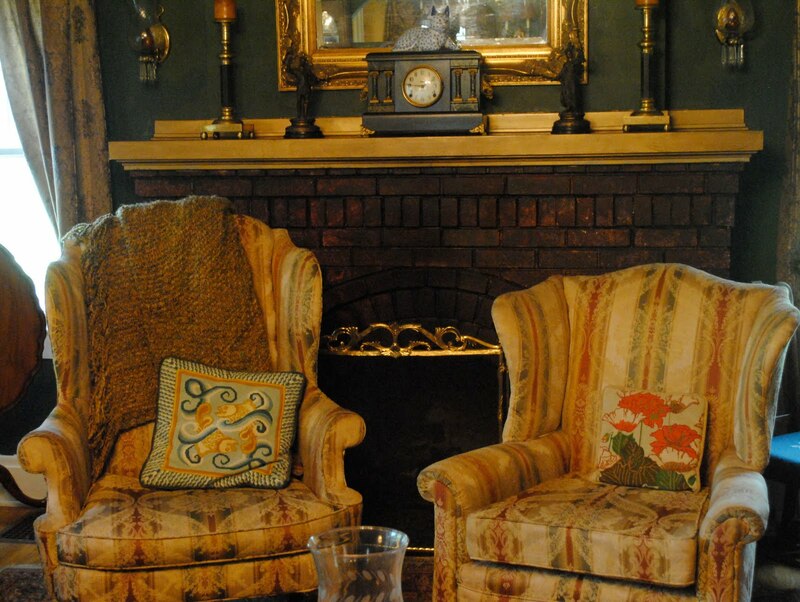 And then there are these -- the chair pillows! The chair pillows are old -- so old, in fact, that they perhaps could be called vintage. For early in our married life (and before children) needlepoint was a passion. I always had a canvas and stitched contentedly as we traveled highways and byways and as I sat and watched television. But children came, we moved, and the pillows got put away. Unlike some things, they didn't get put out for a rummage sale or even given to charity but put away. For how could I giveaway something that I had done by hand? And so in time, they made a reappearance. And surprisingly, they look as good with 2010 decor at Linderhof than they did with the 70's decor of a house long ago. I loved this one and the colors -- so perfect then and they look good now! 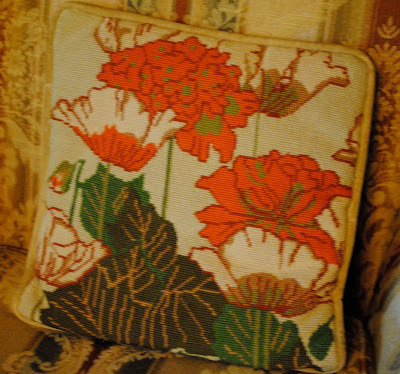 Surprisingly enough, the red doesn't seem to clash -- this, I think, perhaps is the most 70's of all the pillows! I loved blue and white and Asian things even back then -- it's a great accent to the blue and white pieces in the living room at Linderhof. And finally, this wee green one -- a pillow of many stitches. 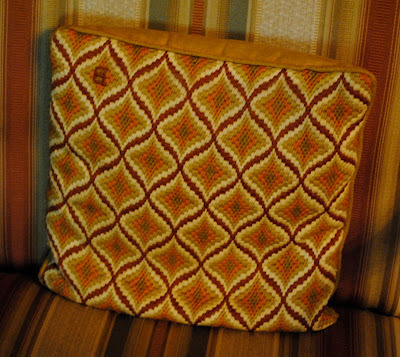 You can't have a chair without a pillow and I think anything made with love is special -- even if it was made eons ago. Mrs. Blandings did a post about needlepoint recently and got my juices flowing. I'll have to visit some shops next time I'm in the City or perhaps browse on line. I think it's time I pick up the needle again! It's Tuesday which means that it's time to join Tam at The Gypsy's Corner for Three or More Tuesday -- I have four pillows so that qualifies! Martha, these are absolutely gorgeous. I remember my mom and I needlepointing together in the early 70's! She still has her pillows, as well. Your work is phenomenal. Yes, you must pick up the needle again! 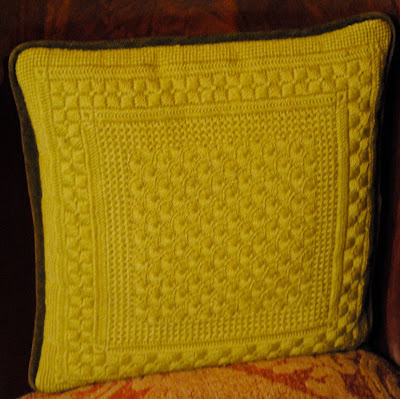 I was needlepointing like mad in the 70's and still have some completed canvasses that were never made into pillows. I'll have to go on a hunt for them. Yours are lovely - so comfy looking. They are fabulous! So special as you made each stitch with love. Just think how much they'd cost if you found them whilst antiquing? Pillows replaced teddy bears for me! I want them at my back, on my bed and occasionally hug one!! Your pillows are quite beautiful. I can only imagine the work that went into each one. The second one reminds me of a William Morris print from the arts and crafts style. There's nothing like a comfortably loved pillow--except maybe a teddy bear! Your pillows are beautiful, Martha, and a real treasure. I have a few my grandmother made and I think of her every time I see them. Martha, Your pillows are beautiful. I am an avid needlepoint stitcher and always have been of some kind or another. 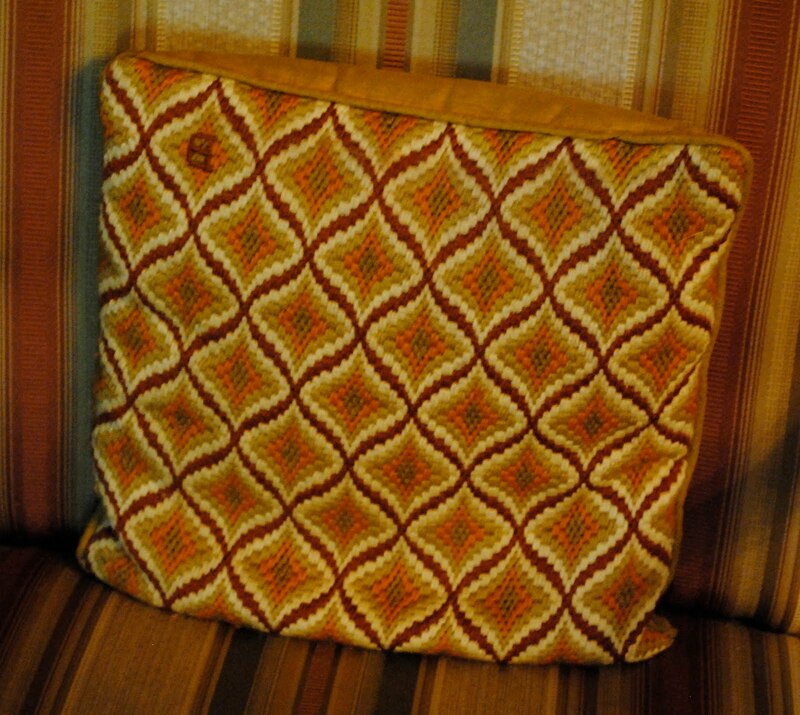 The very first needlepoint piece I ever did, I think I was in my early 20's, was a Bargello piece. I gave it up for many years while raising a family and thought it to be boring but in between doing a lot of counted cross stitch or crewel embroidery. About 20 years ago I began doing needlepoint once again and never tire of it. After all it is art. Such lovely pillows these are! 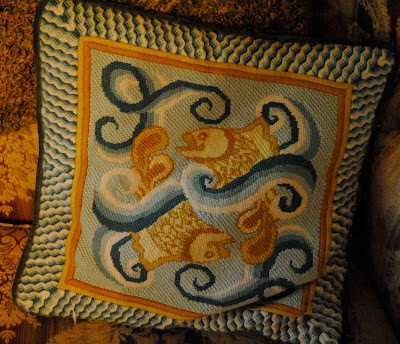 I have some pillows my mother worked in the 40s....I think I like your Asian fish pillow best of all, but they are all great. I'm so happy to hear that you didn't toss the pillows to a garage sale. I have all the pieces I've ever stitched with the exception of the many I gave as gifts and one sampler piece. Why I let the sampler piece go to the thrift store I'll never understand. What was I thinking? Many of my pieces are from the 70s, but I'm also still stitching! I've enjoy stitching needlepoint since I was a child. Thanks for sharing your lovely work. I love your lamps! They are beautiful! Oh yes, my soul sister -- pillows are a must. Howard hates them, so do my brothers -- what is it about pillows and men? They only like them if they are going to take a nap and need one under their heads! Which reminds me ... I need some NEW decorative cushions for the chairs and sofas .... see what you started? I'll tell Howard it's all Martha's fault.